Wondering if you should take GO Transit? Consider these benefits for riding with us, and leaving your vehicle at home. Driving can become costly given the price of gas and parking, as well as the wear and tear on your vehicle. Plus, the amount of time you spend driving also adds up. Leave the driving to us. Many of our regular customers consider their time on GO their “me” time. You’ll find a quiet zone on the top level of our trains. Read, have a nap, or visit with your friends or family if they’re along for the ride. 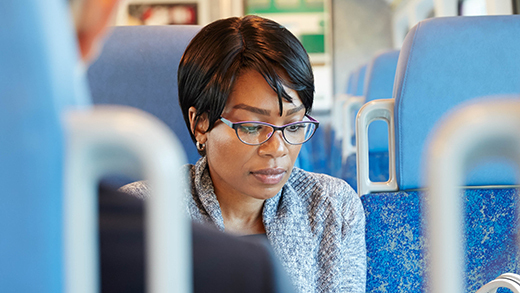 Our trains and buses have plenty of elbow room for you to work on your device. And free Wi-Fi is now available at almost all stations and bus terminals. Grab a bite or a beverage. At many of our stations, you can buy snacks and drinks to enjoy before or during your ride. However, please think of other passengers by cleaning up after yourself and putting your garbage in the proper bins. Looking at the bigger picture, you’re helping cut down on road congestion and carbon emissions by riding with us. Those are huge benefits for everyone in the long run.